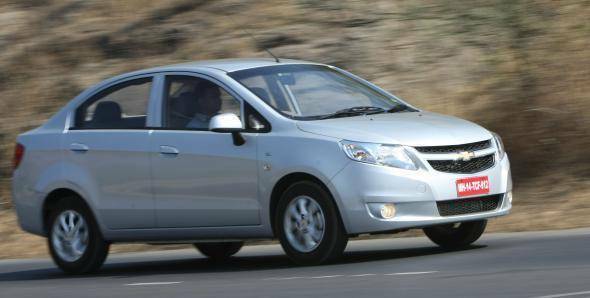 The GM-SAIC alliance resulted in the launch of the Sail U-VA recently, but as expected the company is ready to roll out its second offering, the Sail sedan. The Sail is based on the U-VA hatchback and it is no surprise to see a lot of shared components and panels. Look at the car and you will notice that the front section until the B-pillar is exactly identical to the U-VA. It's only from there on that the design is all-new. It's a simple design yet again and goes well with the front. There is a sense of an old-school sedan in the Sail. The roof doesn't sharply drop down to the boot and is quite smartly executed. The rear quarter panel are quite large though due to small wheel arches, similar to the Ford Fiesta. The taillamps are simple yet functional and blend well with the boot. The car isn't a sub four-metre sedan and unlike the Dzire and Indigo CS looks quite proportional. The car however looks the best when viewed from rear three-fourths. In fact it is a smarter overall car when compared to the U-VA. Inside, the interiors are identical to the hatchback. Even the dual-tone beige/brown dashboard has been carried over. So one gets the same bland interiors and those weirdly placed power window controls. Front legroom and headroom is same too. The steering wheel is also the same so expect no audio controls even in the top end LT model. At the rear the seats are angled more towards the back thanks to the car being longer than the hatch. The kneeroom is similar and just like in the U-VA is good for tall passengers even. Under seat storage at the rear is unique and great for additional storage. The most important aspect that differentiates the SAIL from the hatch is the boot, the bootspace is impressive and can easily take in a lot of luggage. The seats however don't flip ahead like the U-VA's. In terms of engines, it borrows the same 1.2-litre petrol and 1.3-litre diesel that does duty in the U-VA. The diesel is definitely the pick of the lot and other than decent performance and driveability, the gear shifts are positive while the throw is short. The petrol engine however lacks low end grunt and results in one shifting quite a bit in town. On the highway however it cruises comfortably at triple digit speeds since it's happy at higher revs beyond the 3500rpm mark. Both engines are quite noisy, better cabin insulation will definitely help cut down the noise.Though the engines and kerb weight are identical to the hatchback, the fuel efficiency of the sedans was slightly lower, with the petrol returning an overall of 13.9kmpl (claimed 18.2kmpl) while the diesel returned 16.7kmpl (claimed 22.1kmpl). We tested the cars, the diesel managed to cross the 100kmph mark in 15.91 seconds while the petrol did the same in a quicker 15.09 seconds. The petrol and diesel maxed out at 157 kmph and 162kmph respectively. In terms of dynamics, the additional boot doesn't make any difference to the handling. The car lacks high speed stability and the light steering (helpful at parking speeds) doesn't really weigh up and lacks feedback. Ride quality is good and a boon to those driving on broken patches and potholes quite often. In terms of variants and features, everything is carried over from the hatchback and hence will be offered in six variants in total. LS, LS ABS and LT ABS in both petrol and diesel form. The Sail will compete with the Maruti Suzuki Dzire, Toyota Etios, Mahindra Verito and the Tata Manza. All cars that are proven and strong in many ways. GM will have to get the pricing right if it wants to have a share of the entry level mid-size pie. Going by the U-VA's pricing, we expect the car to be priced between Rs 5.7 lakh for the base petrol to Rs 7 lakh ex-showroom for the top end diesel. If these are the prices, expect the Sail to do well, something GM is desperately looking out for. Watch out for a comprehensive road test of the Sail sedan twins in the February issue, out on stands soon.